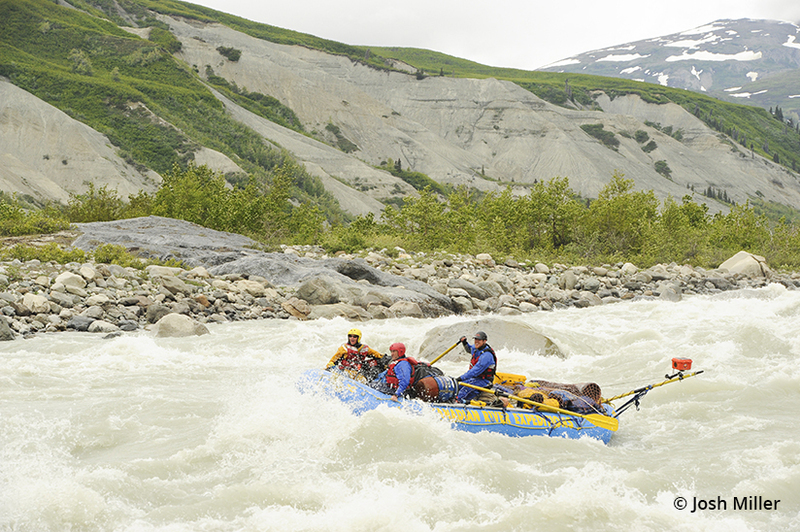 In 2007, National Geographic ranked the Alsek as the number one whitewater river trip in the world. Adventure for adventure’s sake is always a good thing, but it’s even better when it morphs into something bigger. We started out on a trip of a lifetime to do a photo shoot on the Alsek River for Yukon Tourism and Canadian River Expeditions. The Alsek, considered by many to be one of the most magnificent rivers in North America, flows from the Yukon in Canada to the Gulf of Alaska in Glacier Bay National Park. With a 160-mile run and fewer than 200 people rafting the full length of its waters each year, the Alsek is not only a bucket list trip for the excitement of its whitewater and the beauty of its calving glaciers and iceberg-filled lakes, but also for the remoteness of its surrounding wilderness, offering endless photographic possibilities for the amateur or professional photographer. While the stretch of the Colorado River through the Grand Canyon is held up regularly as the top rafting trip in North America, late at night around a campfire many Grand Canyon river guides will admit they dream of someday running the Alsek. Perhaps the rapids aren’t as wild as those on the Colorado, but because of its pristine landscape, in 2007, National Geographic ranked the Alsek as the number one whitewater river trip in the world. Keeping one’s camera easily accessible is key to capturing quick moments like this, as rafts line up for a moment beneath towering peaks. 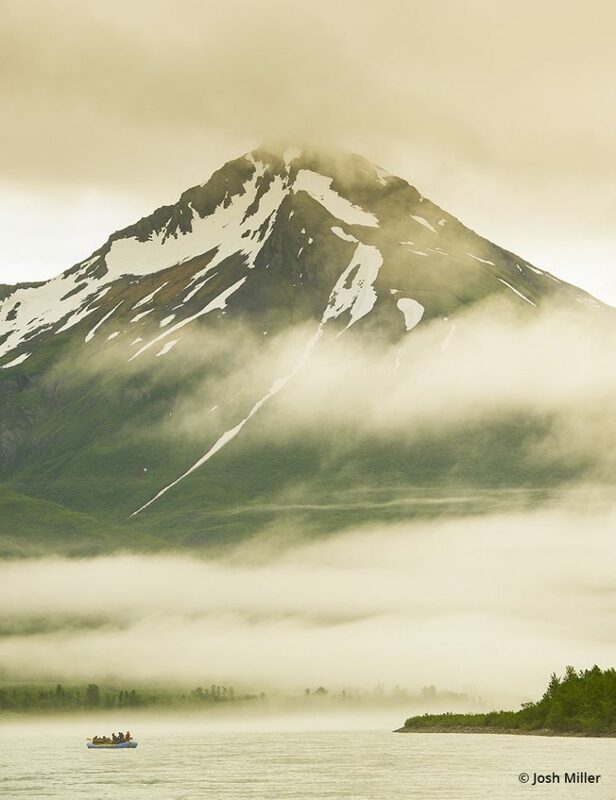 A trip down the Alsek takes a photographer through a wilderness of subarctic tundra, spectacular mountain landscapes and some of the world’s most active glaciers. In many places, jagged teeth of blue ice from surging glaciers calve into the river and lakes, and rafts have to navigate through iceberg-dotted waters. On other days, boats float lazily by hillsides blanketed with pink fireweed, bluebells, lupine and Mountain Forget-me-nots. Further down the river, the mountainsides become lusher, covered in spruce, alders, willows and cottonwoods. As for wildlife, the watershed boasts the largest concentration of Dall sheep in the world, as well as high densities of both grizzlies and black bears, including the rare silver-blue glacier bear—a black bear subspecies. These spectacular animals vie for photographers’ attention with mountain goats, wolves, moose, woodland caribou, foxes, trumpeter swans, peregrine falcons, bald eagles and arctic terns. So whether a photographer is looking for stunning landscapes, exciting wildlife or both, this northern watershed is never short on subject matter. To add to its fame and allure, the Alsek is also one of the greatest environmental success stories in North America. Despite its reputation as perhaps the most glaciated and untouched watershed left on the continent, in the late 1980s, a major open-pit copper mining operation was proposed near the confluence of the Alsek and its sister river, the Tatshenshini. Not only would the mine destroy the mountain at the proposed site, but it would also require major infrastructure construction. After the roads, bridges and huge pipelines were built, two large dams would be needed to keep the acidic tailings ponds from poisoning the Alsek and Tatshenshini salmon and other wildlife clear to the Gulf of Alaska. In a seismically unstable area, there was a high possibility of an environmental disaster from such a mine. This risk, along with the more immediate destruction of the wilderness from significant human development and the threat to salmon fisheries in Alaska, triggered international concern. Conservationists, artists and politicians from both Canada and the United States raised their voices in protest. In 1993, the efforts of thousands of concerned citizens paid off, with the Canadian and American governments working together to protect 12,000 square kilometers of the Alsek and Tatshenshini watershed with the creation of Tatshenshini-Alsek Provincial Park. Home to the world’s largest non-polar ice field, this park and the three parks around it—Wrangell-St. Elias National Park, Kluane National Park and Glacier Bay National Park—make up the largest bio preserve in the world, and were designated a UNESCO World Heritage site in 1994. As a result of these protections, today’s rafters and photographers have access to some of the most unspoiled landscapes on the entire continent. A photographer can spend weeks on the river without seeing a sign of other human passage, though wolf and grizzly tracks abound. Every bend in the river offers a new and original composition. Action-packed days of rafting past glaciated mountains, alpine meadows, calving glaciers, icebergs and gravel bars, dotted with stalks of showy magenta flowers and the occasional bear, make it impossible to run out of things to shoot. The Alsek is truly one of the few remaining wild places on earth where photographers can lose themselves and imagine for a moment that they are the very first to capture images of landscapes as breathtaking as Lowell and Tweedsmuir Glaciers and the towering icebergs of Alsek Lake with Mt. Fairweather in the background. When we first flew north to begin rafting the Alsek River for an exciting photo job, we didn’t think we’d be photographing and writing for a cause. But long before our trip ended, we knew we wanted our work to help showcase the beauty and fragility of this irreplaceable watershed and tell the story of its narrow escape from destruction. For us, the trip was so much more than mere adventure, and we hoped, at least in some small way, to do our part to keep the Alsek wild. Rafters get closer to Glacier Bay, the weather begins to change and mornings often start off with a dramatic layer of marine fog that makes for amazing images of rafts peaking in and out of fog banks. While the logistics of going on a two-week expedition can be challenging for anyone, they are doubly challenging for a photographer who needs to keep gear dry yet accessible, recharge batteries and manage large numbers of images. Having taken thousands of dollars of camera gear down several of North America’s biggest and most remote rivers, the two things I always come back to are simplicity and redundancy. In terms of redundancy, I split my gear and pack it into two waterproof Pelican cases. I keep a single camera body with wide, mid-range and telephoto zooms in a Pelican case strapped next to me on the raft for easy access. Ditch the lens caps, because they just get lost overboard, anyway. I keep my backup body, solar gear, extra cards and extra lenses in a second case on a different boat. That way if the worst happens, our boat wrecks and I lose all my gear, I still have my backup equipment from the second boat. To keep my batteries charged, I use a portable solar panel made by Brunton. I pair my panel with an earlier version of the current Brunton Servo 120 battery pack. Charging a battery pack with the solar panels allows me to power my camera, phone and flashlight even when the sun isn’t shining. I can charge my gear at night or even inside a closed Pelican case while going through a rapid! One of the big advantages of shooting in the Northern latitudes during the summer is the near 24-hour sunlight, which makes keeping batteries charged fairly easy. The first thing I do when I get to camp each day is set up my solar system to charge the battery pack. Finally, waterproof camera housings are a great way to add depth to one’s portfolio while on a river trip. I use a waterproof housing for a high quality point-and-shoot that costs just a couple hundred dollars. This allows me to get usable images without having to spend thousands of dollars on a DSLR housing that I may only use a few times. Though much of the shooting on a rafting trip is from the boat, the rapids can usually be seen far in advance, so there is plenty of time to pack away expensive gear and use the cheaper point-and-shoot when the splashes come. This hand-held stitched panorama of the upper Alsek watershed shows how the river begins as a slow meandering river before it later becomes a raging torrent through unraftable Turnback Canyon. If the thought of so much untouched wilderness is exciting your adventurous side and you are ready to pack your gear and hit the water, there are several different trips on the Alsek depending on your time and experience level. Most photographers will choose to go with a guide company in order to focus on shooting and not on logistics and navigating a boat through whitewater. The other advantage of going on a guided trip is that while the guides are cooking amazing meals, you are free to shoot rather than cook. 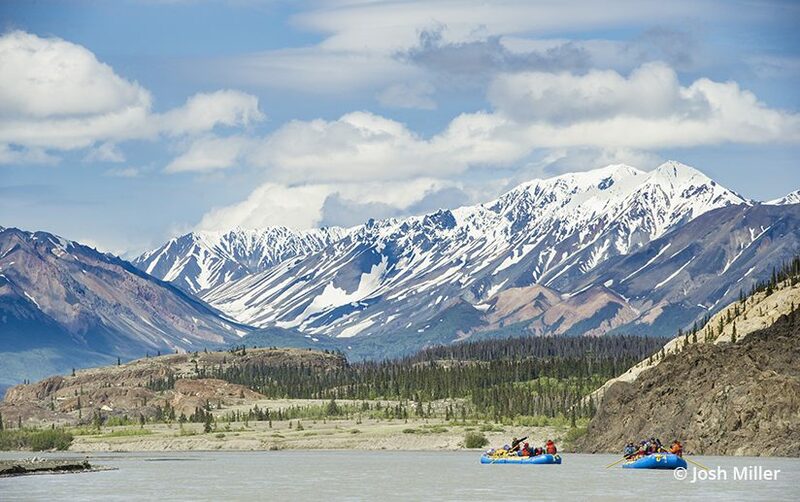 To experience everything the Alsek has to offer, the ultimate trip is to run the full Alsek River from Kluane National Park in the Yukon Territory to Dry Bay in Glacier Bay National Park, Alaska. This is the longest version of the trip, can last up to two weeks and is only taken by about 150 people per year. 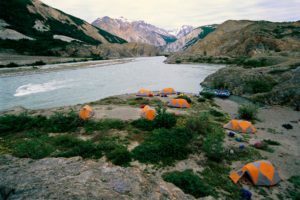 It includes a helicopter portage over unraftable Turnback Canyon and the Tweedsmuir Glacier, but while this adds lots of excitement to the experience, it also increases the overall cost of the trip. The next option removes the helicopter portage, but still keeps most of the length by beginning on the Tatshenshini River, which joins the Alsek River after Turnback Canyon. Though the spectacular parts of the upper Alsek will be missed with this option, photographers do get a chance to see a different part of the watershed, and the Tat—as most locals call it—is an incredible river in its own right. The third and shortest option is to raft the upper Alsek and end at Turnback Canyon, where instead of portaging and continuing downriver, a helicopter takes rafters back to civilization. This option reduces the overall length of the trip, but at the expense of rafting with icebergs on spectacular Alsek Lake. Due to its remoteness and the limited number of permits issued in order to keep the wilderness pristine, there are only a few companies offering trips on the Alsek each year. 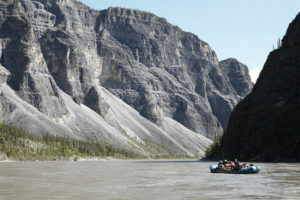 A quick search on the Internet reveals different departure dates and companies, but in my opinion, the very best is conservationist Neil Hartling’s company, Nahanni River Adventures & Canadian River Expeditions. They focus exclusively on northern rivers and have an impeccable track record of both safety and environmental stewardship.